What do you expect from a cheese supremo? I expect a bunch of great cheeses and a tasty sauce! The problem with me is that I always expect more of myself. I enjoyed this cheese pizza but I just wished it had bacon on it. Bacon on a cheese pizza? Yes one of my favorite pizzas is a cheese pizza with a little bacon and white onion on it. I know, I know it is no longer a cheese pizza but that is how I like my not so cheese pizza. 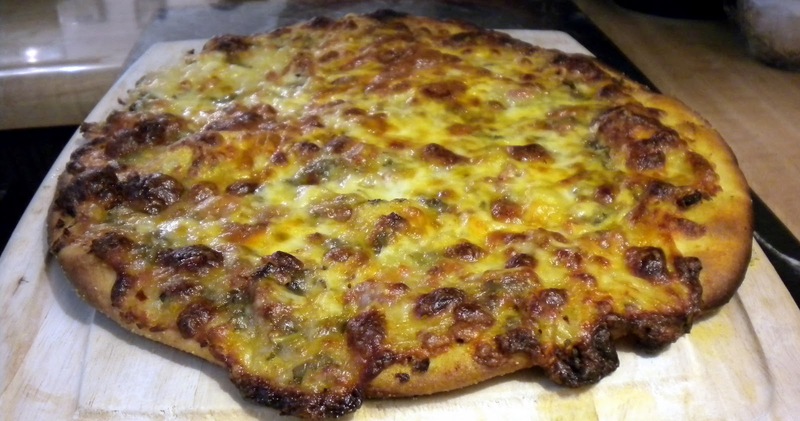 For those of you that do not like bacon or onions, this is the traditional cheese pizza for you! Enjoy! What works best for me is I strongly throw the ball of dough down on a solid flat surface covered with a piece of wax paper until it is large and flat enough for me to easily balance on top of both of my fists. Then I make an X with my arms keeping my fists close together (backhand to back hand, the dough atop of them both) and I fling the dough upwards with my fingers as I simultaneously bring my arms quickly parallel (palm to palm) about 3-4 inches apart. As the dough falls I remake my fists and catch the dough atop them again in the X position and repeat until the dough has formed a 12-14 inch crust. Mix all ingredients together until mixed well. Mix all ingredients together in a small bowl until mixed well. Sprinkle corn meal onto a baking sheet and lay skin on to it. Using a pastry brush, brush the outside rim about 2 inches in with the brushing sauce. Pour the sauce into the center of crust and spread sauce evenly up to about an inch and a half away from the edge of the crust (I find using a pastry spatula works great for spreading tomato sauce.) Evenly sprinkle cheeses over the sauce. Place pizza on baking sheet lightly coated with corn meal. Arrange your oven racks to where they are on the upper and lower thirds of the oven. If you are using a baking stone as we do place it directly onto the floor of a preheated oven for 45 minutes (but you will be less likely to ruin your pizza stone if you place it on a rack at its lowest position.) Place baking sheet with pizza on the lower oven rack and bake for 7-10 minutes, move pizza on baking sheet to upper rack and bake 7-10 minutes (if cooking a second pizza you can put it on the lower rack now on a separate baking sheet.) Slide Pizza off of baking sheet directly onto baking stone and cook for 3-7 minutes or until crisp and bottom is browning (if you were cooking a second pizza you would move it to the top rack on its baking sheet once you slide the first pizza onto the baking stone and of course you would move it to the baking stone once you have remove the first pizza and cooked the second one 7-10 minutes on the upper rack.) Slide pizza onto a cutting board or baking sheet, squeeze fresh lemon juice over pizza, sprinkle with red pepper flakes and use a pizza slicer to cut into 8-10 slices and serve hot with your favorite pizza sides, seasonings and sauces!